Unlike the other “large” proprietary vector editing program in our space, AutoCAD now has a version in the Mac App Store. 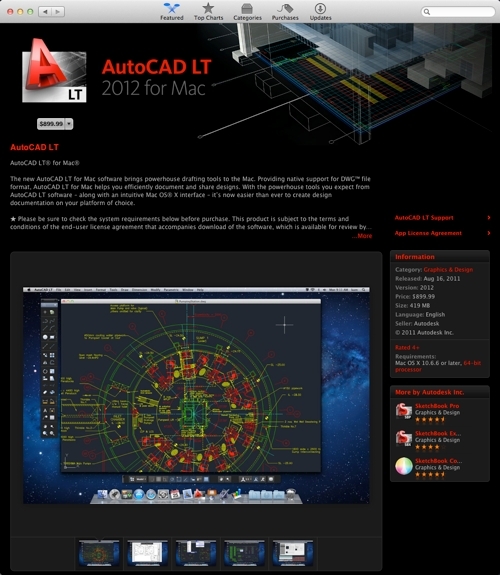 The new AutoCAD LT for Mac software brings powerhouse drafting tools to the Mac. Providing native support for DWG file format, AutoCAD LT for Mac helps you efficiently document and share designs. With the powerhouse tools you expect from AutoCAD LT software along with an intuitive Mac OS X interface it’s now easier than ever to create design documentation on your platform of choice. In a past life I would have been all over that. Today though I don’t use DWG enough to justify paying $900 for AutoCAD LT. Too bad though, it looks very nice.